The Federation, Empire and Dynasty will attempt to conquer the galaxy starting this Saturday at 1000 UTC. Pick a faction early to elect faction leaders responsible for ship deployment, war infrastructure and diplomacy. Let's see if something interesting happens if it passes. Vote yes! No chances in how it works, aka it is still the "don't sleep or lose a planet"? The current attack signup system is really bad. It shows a shiny attack planet button on the top which nabs will inevitably press, attacking the wrong planet with the wrong people which screwes over the faction. There is also an issue that lots of people will see a defend button, lots will quickly click it and it will turn into an attack planet button which they didn't want to press and they will attack the wrong planet. Sounds unlikely, but it already happened to me. The current system also makes nabs discouraged from playing. I see the new system and it fixes most of the issues. I am kinda sceptical about the launch multiple invasions on 1 planet though. Do you really want to have 7 invasions at once on your homeworld? That makes defending it pointless. Without the ability to attack the same planet you can have bad players attacking some backwater planets and it will make them useful. 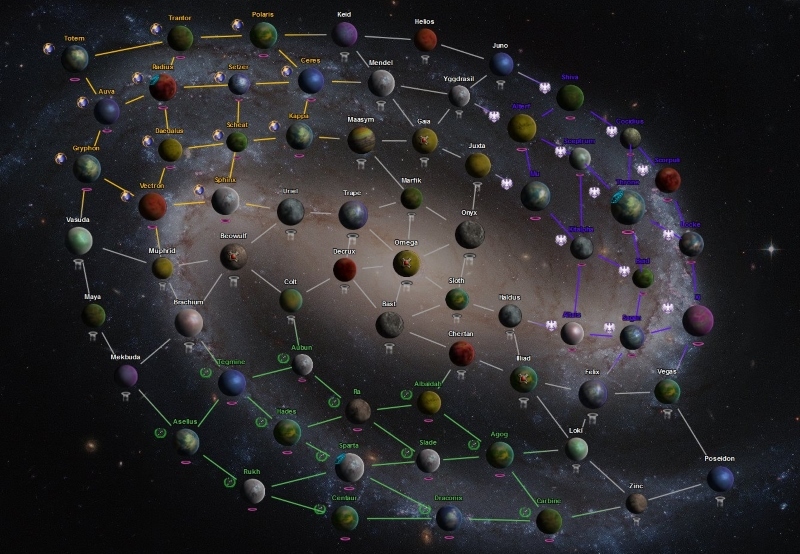 Also, when defending if there are 7 invasions on your planet, you don't know where to put your good players-with one invasion per planet you can have an self-balancing system where pros get or defend the good planets and bad players get/defend the less important ones. This might actually lead to having balanced battles in PW. None of this was implemented, only some adjustments to rush costs and artifact energy requirements as far as i know. Planetwars sounds awesome. I assume it is aimed at veteran players, though. All of that stuff on the wiki is basically correct, although some details may have changed. So... who wants me on their team? I would like you on our team Scrangos. I'm willing to offer some clout and an influencial position in exchange for your loyalty. Guaranteed to have a role in the Federation government. Proud commanders, do not be swayed by temporary positions other actions may give out for free, their governments are worthless and unjust. This Planetwars is about control of the entire Galaxy! The Federation and Dynasty of man hold no true claims to power, they are just rebellious upstarts whos' claim to power will wash away like grains of sand to the oceans of time. Only the Empire holds a Divine Spirit, a just claim to management of the proud races of this realm. Believe in your Emperor, for by His will the galaxy will come again to peace. Join us unaligned commanders, the Empire protects! Previously I declared I'd join dynasty but since mumble clan joined it I am not sure that's a good idea. Maybe I can be still convinced otherwise. On the last planetwars, Mumble fought for the free interstellar empires, that formed the federattion. It was a hard and though fight! But at the end, we succeded to end the terror that got spread by our enemys. Alot of time has passed since the last battle on throne ended, we settled down and rested. But now it is time to choose once again a side to fight for. And therefor once more Mumble declares its loyalty to federation! Don't let the elitist establishment that is Empire or Dynasty fool you. You have no chance of being promoted. Fresh new talent goes unnoticed in Empire in favor of the old guard. Come join Federation where we are ruled by the principles of MERIT! Good ideas get you promoted in our semi-flat management structure! New people are granted the tools and opportunity they need to present their unique talents. Those who do not notice new blood or fresh talent are doomed to die off. New talent is our life blood, our future! The future is Federation! Don't let your potential die just because you aren't a member of the old guard. Join Federation, where you can succeed! You talk about democracy, but you mean populism. You talk about peace, but you mean hegemony. You talk about merit, but what you really care are the numbers of grunts to throw at the galaxy and bring it under your own heel. just like the Feds have done over and over. I don't know what federation was ever meant to be, but here's what it's now: a corrupt sprawling bureaucracy of galactic oppression. Mumble has reversed their decision, Federation now has a clear path to numerical victory.